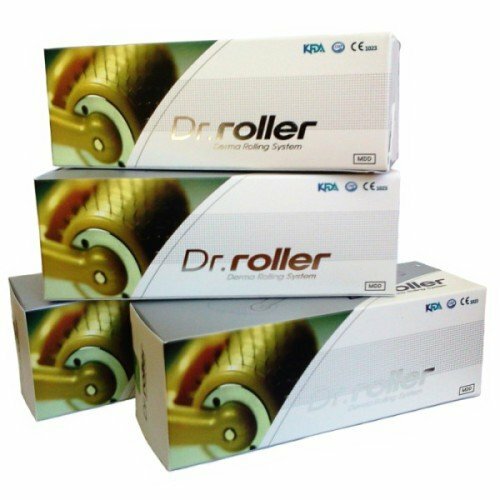 Want to buy a derma roller? 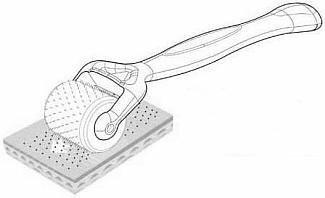 Choosing derma roller needle size is really simple once you’ve read following tips. There are a number of aspects you should keep in mind to benefit most from your derma roller treatments. When choosing derma roller needle length, first think about the body area you are about to treat. Skin thickness in different body areas is not the same – it is thinner in facial and thicker on other body parts. If you are planning to use the derma roller on your stomach, back or thighs, go for longer needles. In these cases pick needle size 1.0 or 1.5mm for best results. On the other hand, if planning to treat your face, neck our other body area with thinner skin, choosing 0.5mm derma roller will serve your purpose well. It is also necessary to mention that 2.0mm and 2.5mm needle lengths aren’t recommended for home do it yourself derma roller treatment, since they might bring severe effects to certain areas of your body. Do not use longer than 1.5 mm needle length derma roller at home! Sadly, needles below 0.5mm are not long enough to simulate collagen synthesis in skin. For this reason, they are not preferred for anti-aging purposes. If you are looking for a derma roller to reduce wrinkles or scars, you need atleast 0.5 mm needle length (for face) or even 1.0 mm or 1.5 mm derma roller (for body areas). You may feel some pain and discomfort if it’s your first time to use a derma roller, especially on sensitive parts of body. Select derma roller needle size carefully to avoid any worry and unnecessary discomfort. For instance, if confused whether to pick a 1.0mm or 1.5mm needles, it’s best to go for shorter length. Going for longer needle length is recommendable when treating deep scars, because they bring better results. 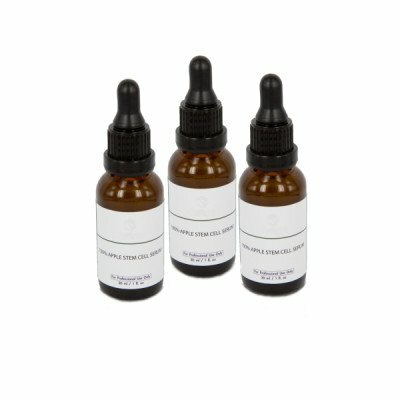 If you are thinking of getting a 1.5 mm derma roller, consider purchasing numbing agent as well. Needling with longer needles usually cause mild to sever discomfort so anesthetic solution use will make the treatment more pleasant. Not all needling skin treatments offer the fast and painless results you are looking for. For example, wrinkle and stretch marks treatments usually get desired results within first few months, but (deep) scar treatments take more time. Sometimes you may have to keep up the regular skin needling regime for atleast a year to see significant improvement in scar tissue. Consequently, if at this point you are still not sure about choosing the correct needle length to target your skin concern, it’s highly advisable to start with the 0.5mm roller, because they are long enough to stimulate collagen synthesis in the skin. Not to mention they are very good to be used on any body part. 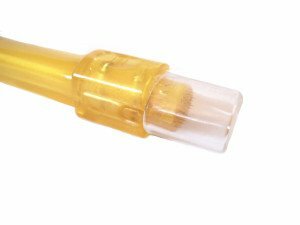 Once you feel more confident about DIY skin needling, you may always get a longer needle derma roller. 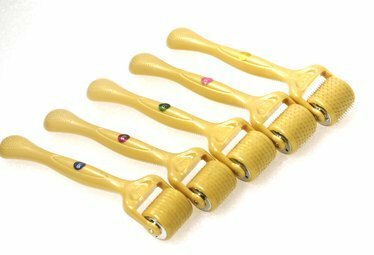 0.5 mm derma roller is also best pick if you are a beginner to skin needling. 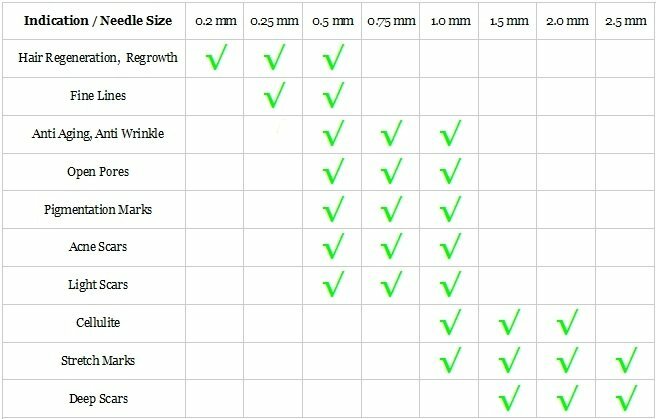 We also provide free derma roller needle size consultation to any one of our clients who have difficulties in choosing the correct needle length. Simply contact us and we give you our recommendation based on your individual needs!